As barrel racers – we’re conditioned to believe that “practice makes perfect” and that “repetition” is how we and our horses learn. But I’m calling us out on that today. You see, doing the same thing over and over and over, like walking, then trotting and loping the pattern for say, three months to start a barrel horse might be a recipe for disaster, IF you’re not doing it in the right WAY. REPETITION ALONE DOES NOT TEACH HORSES. Sure, it’s PART of it, but we can train them to respond perfectly, we can even spend YEARS developing flawless foundations, they can be totally calm and obedient, and honestly – STILL be in another ZIP code mentally. 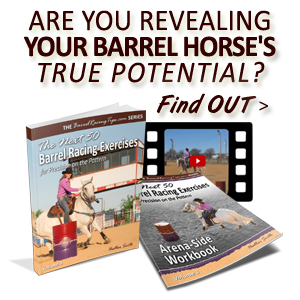 When this happens, it can be easy to miss because they might have “the look” of a barrel horse that has it all together, but if we don’t know how to TEST whether we have the real deal, we’re sure to experience problems on the pattern. 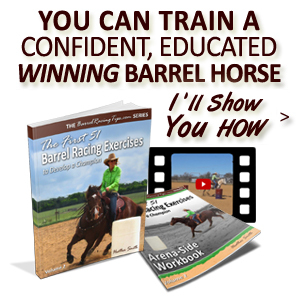 Barrel racing success requires advanced body AND mind development. A horse that is just going through the motions physically isn’t gonna cut it. A horse that has to be ridden perfectly (micromanaged) through every single step isn’t going to either. A big part of establishing and testing responsibility requires putting your horse on his honor. Can you back off on your “aids” and guide your horse with your FOCUS and subtle body language alone? If not, that’s a good place to start testing, even if it’s for the first time on an aged horse. The steps for establishing greater responsibility involve impeccable timing as you make it easy to respond to your subtle communication and difficult not to (more on that below). Well, we can condition and develop our horse’s bodies to be the ultimate barrel racing machines, but if we don’t know how to shape their brains, we’re outta luck. 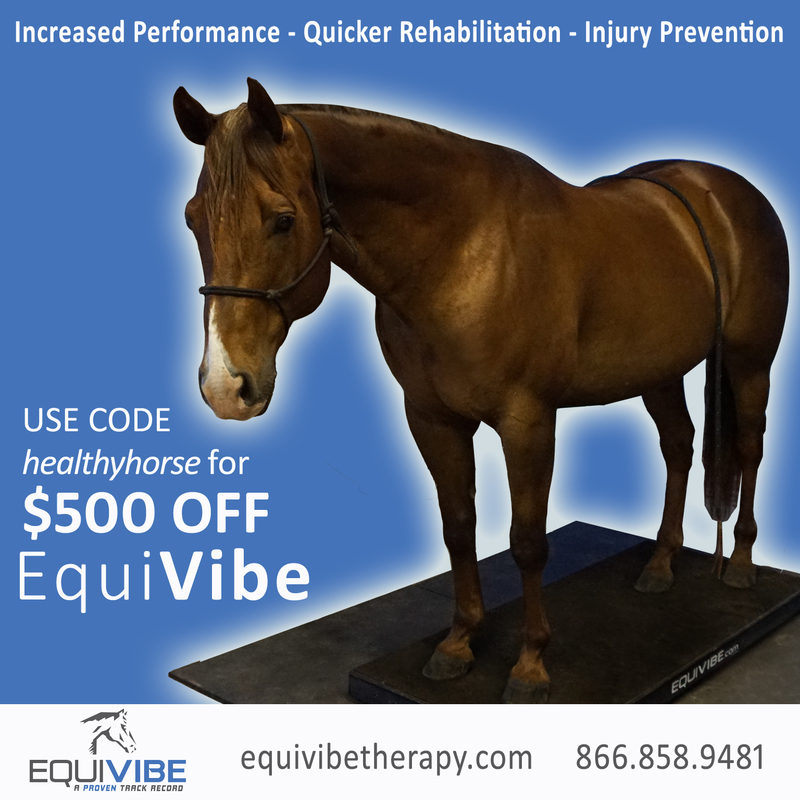 The good news is that we can develop a horse’s try and desire at the same time as we refine their physical education. When we give a horse perspective, they start to look for and crave the easy path. You might wonder – how do we really know when they are TRULY connected and involved in the conversation? Because, as I’ve said – it’s not necessarily obvious when they aren’t, right? Well, one big red flag occurs when you “start talking” (with body language) – you’ll switch gears, change the subject, or ask for a step here or there, or a little softness or bend, and there will be a very subtle delay. Maybe as little as a fraction of a second, but as barrel racers we know that counts! It’s kind like waking someone up from a light nap. Like my darling Pistol, for example – he’s such an obedient, tolerant, good natured and kind boy, but for years he’d often be just a tad late, as in “OH! Uhhhh, ME?? You’re talking to ME?” Knock, knock – no one’s home. Those delays signify lack of mental connection, and will result in even greater delays on the pattern. So another red flag is that your horse will be hard to ride on the pattern – you’ll feel like you have to be 100 places at once, all because they aren’t doing their part (which is our responsibility to teach them). Consider that it’s time to stop beating yourself up for not riding well enough in a run, and start addressing the problem at it’s source. We should always be thinking about how to improve our riding, but that might not be the primary issue. The other suggestion I have is to pay much closer attention to your horses EARS. Where are they, and how are they positioned? Are they forward and tight, back and loose? Depending on the situation and how their body feels, the position of their ears can tell you A LOT about how they FEEL and where their mind is. Your horse’s eyes and entire expression will tell you a lot as well. If you’re a barrel racer, you’re familiar with the glazed over look – you know, the chomping combined with the blank stare. Let me tell ya – it’s not really a good thing. It can be a sign of the “going through the physical motions but a goner mentally” state. An emotionally fit athlete that is focused and ready to perform the task at hand, not escaping into a semi-catatonic state. A horse’s performance will be better when we develop them in a way that never causes or allows them to go there to begin with. I have so much more I could share on this subject, but today I wanted to point you to a few resources I’ve put together that will walk you through the steps to ensure your horse is really involved and on the same page. It’s a worthy area to explore because they difference it makes is nothing short of amazing. When a horse is in the moment WITH YOU, you’re no longer riding ON him, you’re moving together (there’s a difference). The biggest difference you’ll notice of course, is that you’ll stop chasing around the continuous crazy-making (mis-diagnosed) challenges that continue to crop up on the pattern, and as a result see positive changes reflected (subtracted) on the clock! 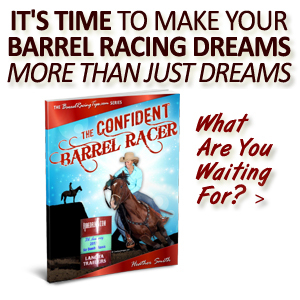 To start, I’ve shared an excerpt from the Horse Positioning chapter from best-selling book, Secrets to Barrel Racing Success. It’s critical that horses develop responsibility for carrying themselves correctly with little guidance. When the time comes to add speed, a horse that is over-dependent on his rider will be unable to efficiently maneuver that pattern without a lot of perfectly timed assistance, which can be difficult if not impossible, and will cause delays in a run for even the most advanced rider. 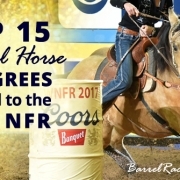 The ultimate barrel horse is one that is confident and prepared enough to make his own good choices, but does not completely take over. Ideally, we are ever so slightly in the lead and when we present a feel, our horse takes responsibility to meet us. If we do our part, not much in the way of corrections will be required. 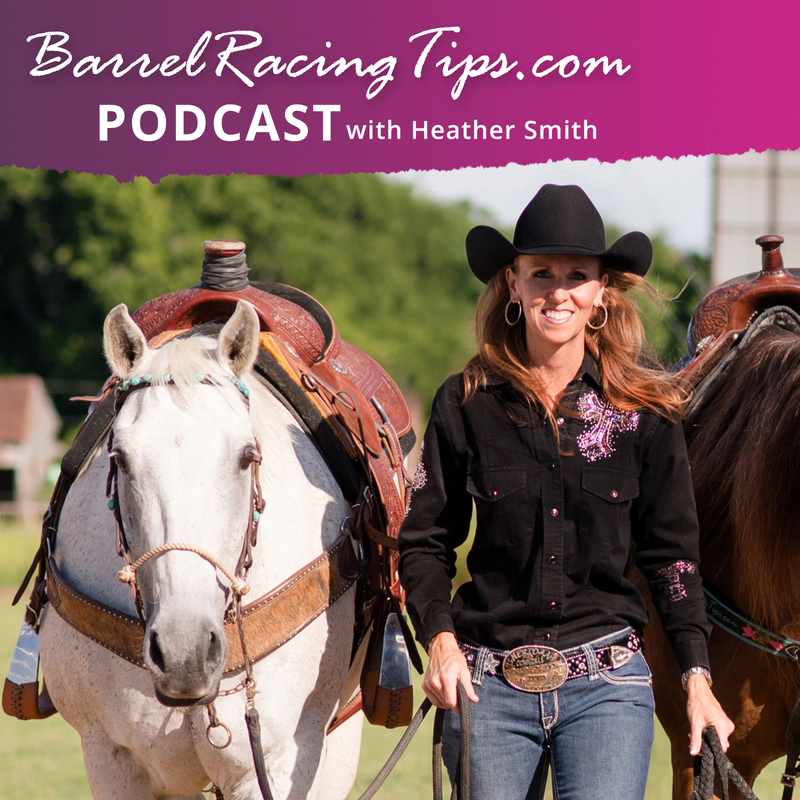 At the same time, a winning barrel horse is willing to accept help or correction from a rider without resistance in those situations when it becomes necessary. This doesn’t happen by magic, we must do our part to prepare, educate, develop and trust our horse before they will be successful in taking on the responsibility to maintain their body position. This means that we must be striving toward this delicate balance at all times, whether on the ground, under saddle, on the barrel pattern or away from it. When we trust a horse, we are setting a positive intention. As we meet a horse’s needs and teach him to take responsibility and be responsive to us, he becomes self-assured, ready to perform with confidence, yet willing to follow our slightest suggestion. By fostering independence in our horses on the pattern, we are building their confidence and allowing them to live up to their highest potential, and making it easier on us as riders in the process. For even more from The Secrets on this topic (+ a FREE Speed Guide), click here. 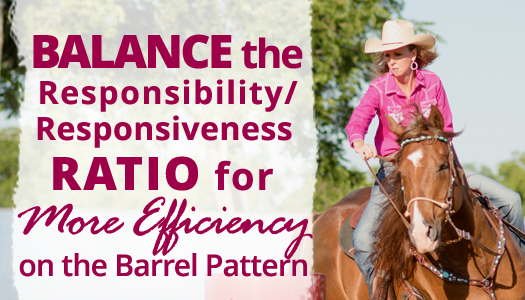 In the comments, I’d love to hear YOUR thoughts, experiences or questions when it comes to the subjects of responsibility and responsiveness on the barrel pattern! Help for a "Hot to Trot" Barrel Horse! 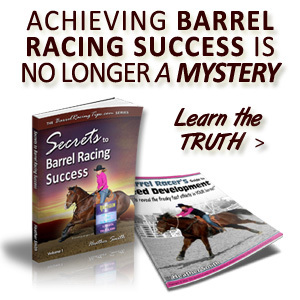 Help Celebrate "Secrets to Barrel Racing Success!" You have hit the nail squarely on the head! I have never heard anyone discuss this topic in such a way. When I asked my question weeks ago, several of your posts gave me some good ideas to help with my problem. But as I read and will reread this article I have a clear focus on what I need to work on. I know my problem is micromanaging and because of that I really focus on letting my horse “take the reins” so to speak, but that has not worked either. There is such a fine line between too much and too little. We are just not in sync (all of the time), one of us is either ahead or behind which causes blown barrels.. not bad but just .5 sec off the pace. So I’m going back to helping him be responsible. Thank you! Thank you for taking the time to dig a little deeper and helping me with my problem! Truly Just Plain Revenge AKA Nick and I are most grateful for your help. I’ll keep you posted on our progress.